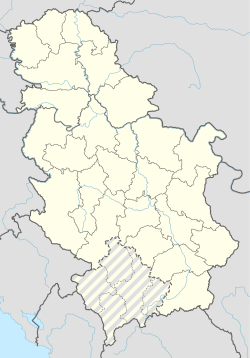 Lazarevo (Лазарево) is a veelage locatit in the Zrenjanin municipality, in the Central Banat Destrict o Serbie. It is situatit in the Autonomous Province o Vojvodina. The veelage haes a Serb ethnic majority an a tot population o 3,308 fowk (2002 census). The veelage is kent as the place whaur Bosnie Serb general Ratko Mladić wis arrestit on Mey 26, 2011. In Serbian, the veelage is kent as Lazarevo (Лазарево), in Croatian as Lazarevo, in Hungarian as Lázárföld, an in German as Lazarfeld. Lazarfeld is an aa an aulder name for the veelage uised in Serbian. The veelage wis foondit in 1809 bi German colonists. In 1800, the first German immigrants arrived at the enormous estate o János Lázár de Écska, the son o Lukács Lázár. “Martinica pusta” wis determined as a location for thair dounset. It wis, besides Ečka an Jankov Most, the third dounset foondit on Lukács Lázár’s estate. In his honour it wis named Lazarfeld. In 1922, the veelage chyngit its name tae Lazarevo. Till the end o Warld War II, it wis maistly inhabitit bi ethnic Germans. Efter Warld War II, the German population fled an the veelage wis colonized bi Serb families frae Bosnie an Herzegovinae. Lazarevo wis the last shelter o the Bosnian Serb general Ratko Mladić who wis arrestit here bi the Serbian special police forces in the early fore-nuin oors o Mey 26, 2011. The arrest teuk place athoot incident as Mladić surrendered hissel as well as twa pistols that he carried. Thare are aroond 3,000 indwallers in aboot 900 hoosehaulds. The wirkin fowk are maistly employed in Zrenjanin, an agricultur is a supplemental activity. The local population maistly assembled bi the cultural society “Slaviša Vajner – Cica”, the volunteer fire Society, an the hunters associations. The local Protestant kirk wis reconstructit an turned intae the first Orthodox kirk in 1998. Unner the name “Zadrugar”, fower sports clubs exist, an its fitbaa team gae a few Yugoslav representatives. Thare is a primary schuil, "Slavko Rodić" in the veelage for childer frae Lazarevo an the veelage o Zlatica. Lazarevo daes no hae a heich schuil, sae childer frae Lazarevo an Zlatica hae tae go tae schuil in Zrenjanin, or in the nearbi toun o Sečanj. Wikimedia Commons haes media relatit tae Lazarevo.